Nicole's Needlework: A Lot of Changes! Wow, where do I begin?? First, we are moving out of our condo at the end of the month. I never thought we would have stayed in the condo for four years - it was just supposed to be temporary. It hasn't been all bad, the only thing we've missed is having our own yard. My husband was offered an opportunity to go TDY in Florida for a few months and he accepted. He'll report to the Tampa office on June 4. The kids get out of school June 1, so it will be a little bit of a rush. We will stay in his parents house while we're down there and leave our things in storage up here. He's going to try to find someone that would like to switch with him and go to Charleston. If he can, than we'll stay down there. If not, we'll have to come back up here. So keep your fingers crossed for us! Second, we have a new family member! I found a kitten meowing outside my door the other day. She was so scared and so hungry. I picked her up and it was love at first sight. We have been wanting to possibly get a cat or small dog for awhile now and I feel like it was just meant to be. The poor thing had so many fleas and three ticks! I gave her a bath and combed and combed her. I took her to the vet the next day and she got her shots and flea treatment. I'm happy to say she does not have one flea on her now!! I also put up a note to make sure she wasn't someone's lost kitten, but no one responded. She was definitely a stray! She has stolen the hearts of everyone. Even my dh, who is allergic to cats, can't resist her. The vet had this bow on her when I went to pick her up. She said she was about 10 weeks old. Oh and we named her Oreo, not very girly, but the kids love it. I do have some stitching share, but I'll save that for another post! Good luck on your move! Bless you for rescuing that kitty! My daughter came home with a stray too. Most people (my husband) are allergic to an enzyme in cat saliva, so if you bathe them each month it helps. Good luck with the move, i hope it all turns out as you wish. Oh, Nicole. Isn't she the prettiest and most deserving little kitty! And the name suits her perfectly. Best of luck on your move--you must be so excited! Oreo is just adorable! She is lucky to have landed on your doorstep. I hope your dream to live in Florida will come true. Congratulations on your movee and the new member of the family! I wanted also to comment on your beautiful Eliz Sheffield start, I had to go look at Jen's after reading your post. Attic Needlework is my LNS...the model they have displayed is done on very small count linen, I'm guessing smaller than 40 ct. While beautiful, it's too 'crowded' looking for my taste. I love the 35-ct version you are doing. I just am amazed at how much you accomplish! Good luck with the move and I hope the location switch works out, too! 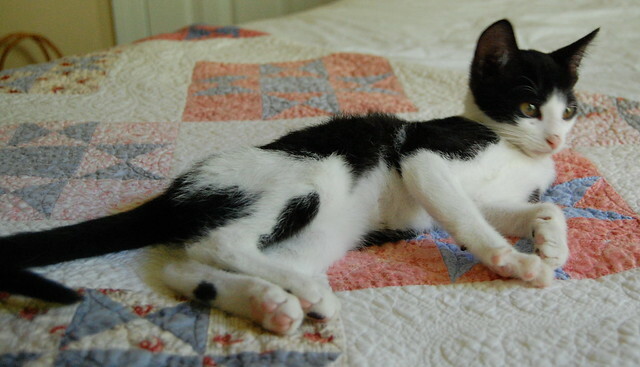 Oreo is A PERFECT name! Yeah, yeah, and OH YEAH !! So glad your family will be in Florida soon. Let me know when you get here and I'll give you the 'stitch' calendar!! I'm so excited. And your new addition, Oreo, is darling. Thanks for taking her in. These stray pets need our help!! :( ... glad (and sad) that you will be gone this summer. Hope your move goes well! Your kitty is just the cutest. P.S. If you need someplace to "store" your stash, just let me know!!!! I love all the pics of Oreo! She is such a cutie -- but I can see what you mean about skin and bones. The poor thing! I'm so glad she found you!! Good luck with the move and all. I hope you can stay there in the end too! It's been FOUR YEARS since you moved to SC? Holy moly, where does the time go? It seems like it's only been a year or two! What a sweet little kitty, Nicole! She's so lucky to have found you! I hope everything goes very smoothly for you, Nicole! What a sweet little kitty, and she is very lucky. Good luck getting to go to wherever you would like to be. Is Chris going to be working for the same thing as before? I hope it all works out for you and so glad that you got this precious little kitty before you moved. She is such a sweet little kitty it looks like and I like the name too!! Keep us all posted! Looking forward to seeing your stitching too. She's adorable. Good luck with the move. Hope your new adventure goes off without a hitch!!! Thanks for adopting that sweet kittie!!! It does my heart good to know that she is in a loving home. Oreo is so blessed. She knew just which door to come to to try to find a welcoming home. So cute. Good luck with all that is going on in your life. Good luck to your and your family with the move! What a sweetie and lucky girl Oreo is! I'm sure that with your love and cam she'll be plumped up in no time. Some tips for the hubbie. Wash hands after handling the cat. There are some allergy sprays at the pet store that you can spray around the house so the dander doesn't bother him. Glad for you and your family's move to FL and hope it all works out, but very sad for us. Will miss you at the French Hens, but hope you will still be coming to MB! Love the kitten and the name is purr-fect! So glad Oreo found you!!!! What a sweet kitty :-). Hope your move goes smoothly and your DH can find someone who wants to swap. I love to hear about wishes coming true! Happy that you'll get to be in Florida near your family and friends, but sad that you'll be further away from you friends here. 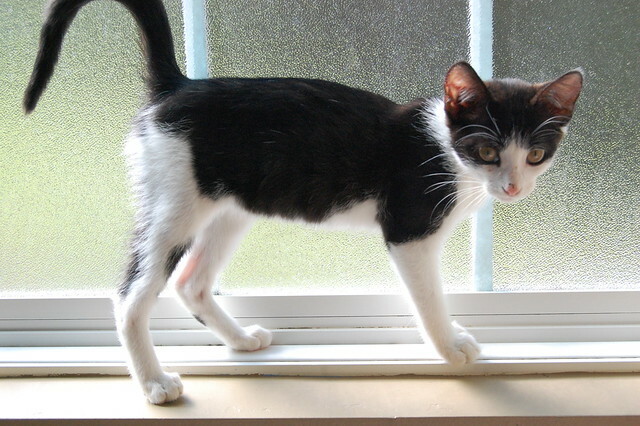 Also love to hear of hearts coming together - Oreo is a great name! Wow Nicole!! I am so happy for you guys....know this is something you guys have been hoping for! I sure do hope things can work out and it will mean you are there closer to family..... Oreo is so cute and I know the boys are doting over her! Pace yourself and good luck with the move....Im sure it will go smoothly....I will see you at PALS!! Best of luck with your transition! 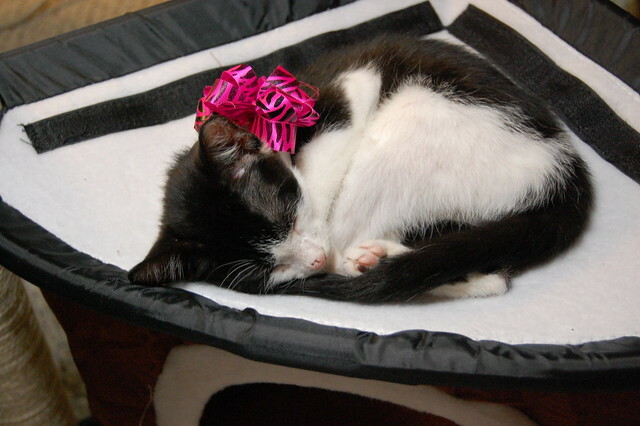 I especially love the sweet picture of Oreo with the bow. Welcome to Oreo! I'm so happy to hear she found you. It was meant to be. How exciting with all your changes in the air. I hope it all turns out th,e way you hope! I hope that everything works out well with the move and that you end up settled for good. What a gift little Oreo is. Sometime's things are meant to be. What a sweetie! Hope everythibg turns out ok for your move. No wonder it was love at first sight, what a cutie. Oreo is wonderful, she is going to be a big girl. Hope your moving turns out the way you want it.